SCOTTSDALE, Ariz. -- Evan Longoria is in his first season as aSan Francisco Giantafter 10 years in a Tampa Bay Raysuniform, but he still follows his old organization from a new league and the opposite coast. He's giving a thumbs-down to one particular roster move this spring. The Rays made a surprising decision Saturday when they designated outfielder Corey Dickerson for assignment during a flurry of transactions. Longoria, who took his spring training physical on Sunday at Scottsdale Stadium, pronounced himself baffled by the decision. "It's kind of a shame,'' Longoria said. "I don't understand it. The guy was an All-Star last year. He's in his early prime. He's still controllable. It just doesn't make sense to me. It doesn't make sense to a lot of people. Corey will end up somewhere and continue to be the player that he is. But I kind of just feel bad for the Rays' fan base. The Rays saved about $10 million from their projected 2018 million payroll with three transactions Saturday. They traded starter Jake Odorizzi, who will make $6.3 million this year and is eligible for free agency after the 2019 season, to the Minnesota Twins for minor league shortstop Jermaine Palacios, and they realized additional savings by acquiring first baseman/DH C.J. Cron from the Los Angeles Angels for a player to be named and designating Dickerson. The Rays have seven days to trade or release Dickerson. By making the move now, they're obligated to pay about $1 million of his $5.95 million salary for 2018. Cron will make only $2.3 million this season and isn't eligible for free agency until 2021. Dickerson, in contrast, will be a free agent in 2020. Cron brings some right-handed balance to a Tampa Bay lineup that had a surplus of left-handed bats. Dickerson, 28, tailed off in the second half last season after making his first All-Star team. He has a .280/.325/.504 slash line in 2,102 MLB plate appearances, and he ranked fourth on the Tampa Bay roster with 2.6 WAR in 2017. The Rays acquired Dickerson from the Colorado Rockies as part of a four-player trade in January 2016. Longoria, who left Tampa Bay for San Francisco in a five-player trade in December, wondered about the message the Rays' decision to part with Dickerson might have on the team's players as well as the fan base. 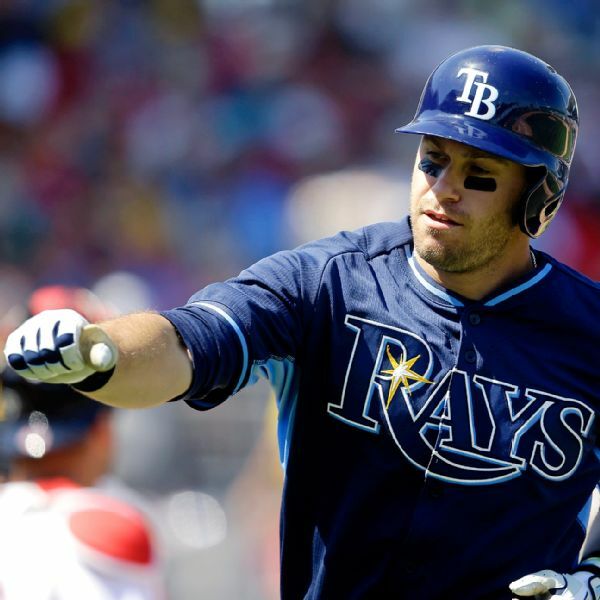 "It's really hard to come into a clubhouse and expect to win when you give away your best players,'' Longoria said. "Corey was our best player last year. He was better than me. Logan Morrison hit 38 home runs, but overall, Corey was our best player.